I was talking to some friends from Hong Kong about Chinese New Year specialties when I happened to mention raw fish. They looked at me blankly. When they continued to look puzzled, I had a moment of panic, familiar to Malaysian and Singaporean Chinese, that my Cantonese was simply unintelligible to people from Hong Kong. This is a very real concern because the Cantonese from our part of the world is sprinkled with non-standard words, many of them borrowed from Malay. Every now and then I’ll say something odd and realize that nobody understands me. Then I have to pretend to cough, or look meaningfully out of the window. But to return to the question of raw fish. 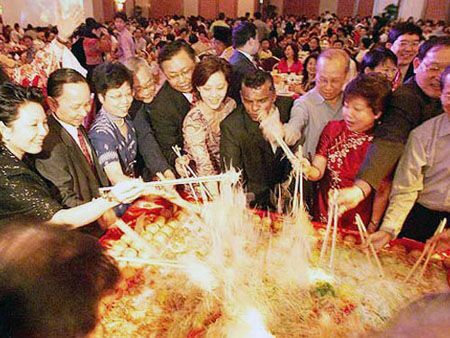 It turns out that this tradition is actually a Malaysian/Singaporean thing and was invented in 1964. The whole business, of course, revolves around the Chinese love for homophones. 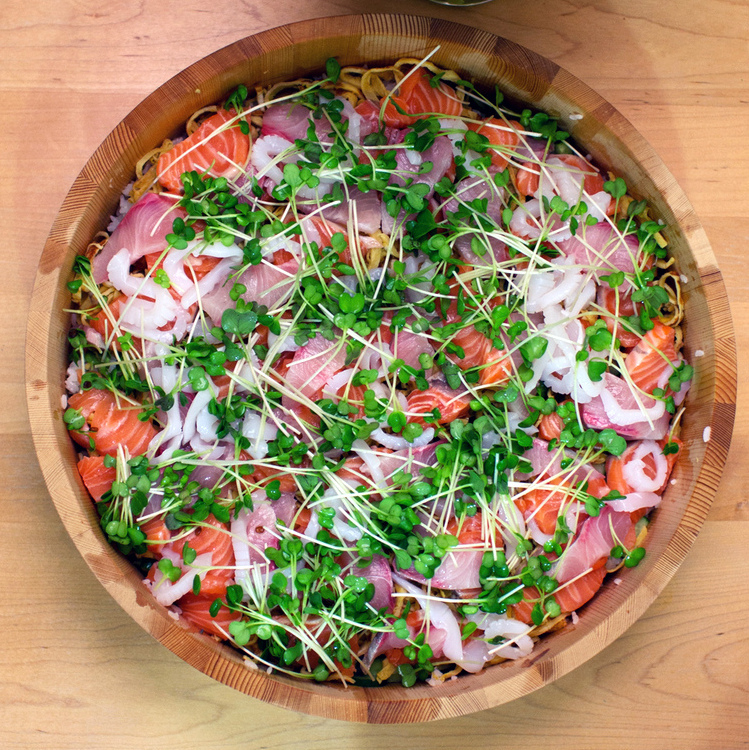 In Chinese, raw fish sounds like “lots of prosperity” and is served at New Year’s in a salad form. Shredded daikon, carrots, jellyfish, turnips, key lime leaves, pomelo, peanuts and other ingredients are tossed with the fish, typically salmon, as everyone shouts various lucky phrases and stirs it with their chopsticks. Lost in this mish-mash, the minuscule amount of raw fish is further obscured by a sweet sauce, and with everyone tossing and yelling over it, it somehow doesn’t seem quite as appetizing. So every Chinese new year, I’ve taken to making my own lucky version with lots more fish. Basically, I serve chirashizushi instead and so far, none of the guests have complained. This is a fairly easy party dish that looks festive and can be adjusted according to the number of guests. It requires a certain amount of prep work, but most of it can be done ahead of time. For 8 people, about 4 rice cooker cups (these are special measuring cups which come with an electric rice cooker) of uncooked rice should be enough. More if you have big eaters, less if you have low-carb guests. Short grained Japanese rice for sushi. Don’t use Jasmine or Basmati. I like new crop (this year’s rice crop) koshihikari rice, much of which is grown in California by Japanese-run corporations and is very good. Sushi vinegar – you can make your own, or buy this pre-mixed at an Asian grocery. If you buy it, make sure it’s labelled for “sushi” and already has sugar/salt in it. A package of daikon sprouts. If you can’t find them, try other kinds of sprouts. Sashimi-quality fish. I buy mine from a Japanese grocery store, where it’s labeled and flash-frozen commercially to kill parasites. Good quality sashimi should also have a point of origin stated on it. Choose whatever fish you like to eat and that looks fresh. This time I used salmon, kampachi (amberjack), salmon roe, and squid, but I also like yellow tail, scallops, and amaebi (raw sweet prawns) if I can get them. If you don’t want to use raw fish, you can substitute smoked salmon which qualifies as “uncooked” for New Year’s purposes. 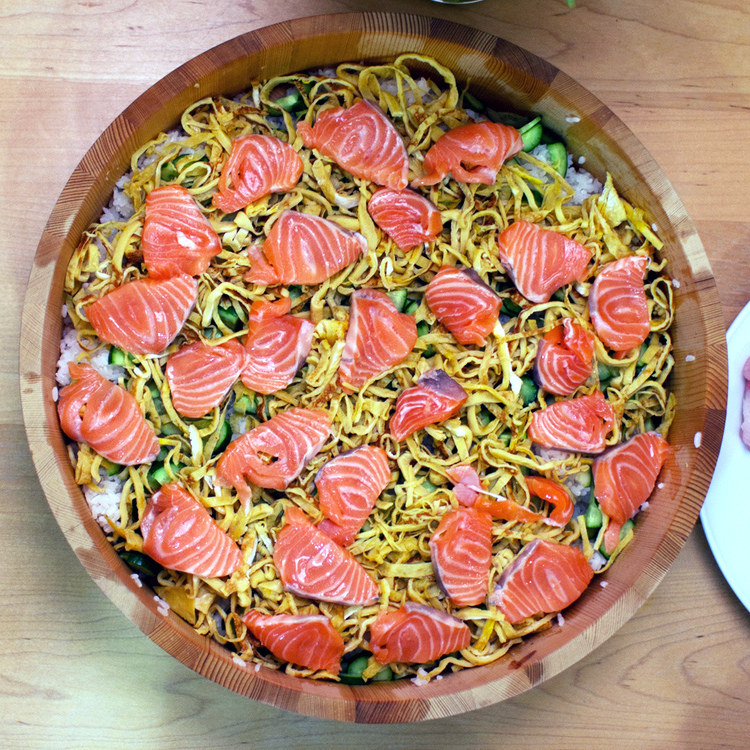 In fact, you can make a really nice version with smoked salmon, crab or lobster meat, or cooked prawns if you prefer. 4-5 eggs for 8 people. Cook the rice in a rice cooker. When done, put it in a large platter and lightly mix the sushi vinegar into it, turning the rice with a paddle and taking care not to squish the grains. Traditionally, you can use a fan to help the steam evaporate and give it a glossy look. If you’re not going to use the sushi rice right away, cover it with a damp towel so it doesn’t dry out. 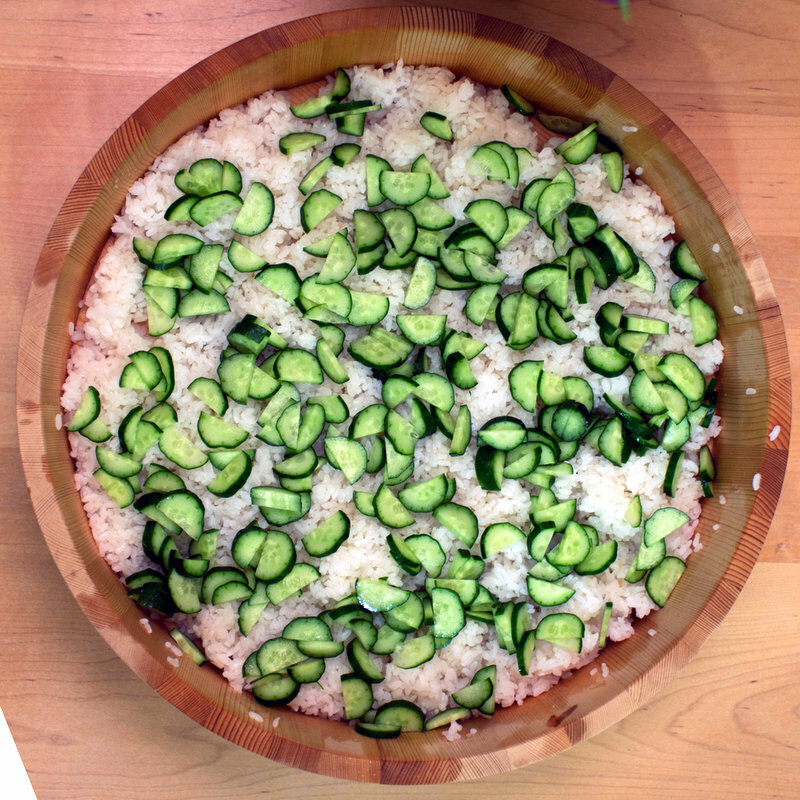 While the rice is cooking, slice the cucumbers in half lengthwise, then cut into slim half moons. If you’re using the English “hothouse” style cucumbers that come wrapped in plastic, their seeds are more watery than the Japanese variety, so you’ll need to use a small spoon to scrape them out. Rinse the sprouts, pat dry, and cut the roots off if they’re still attached in the packaging. Make thin egg pancakes (kinshi tamago). 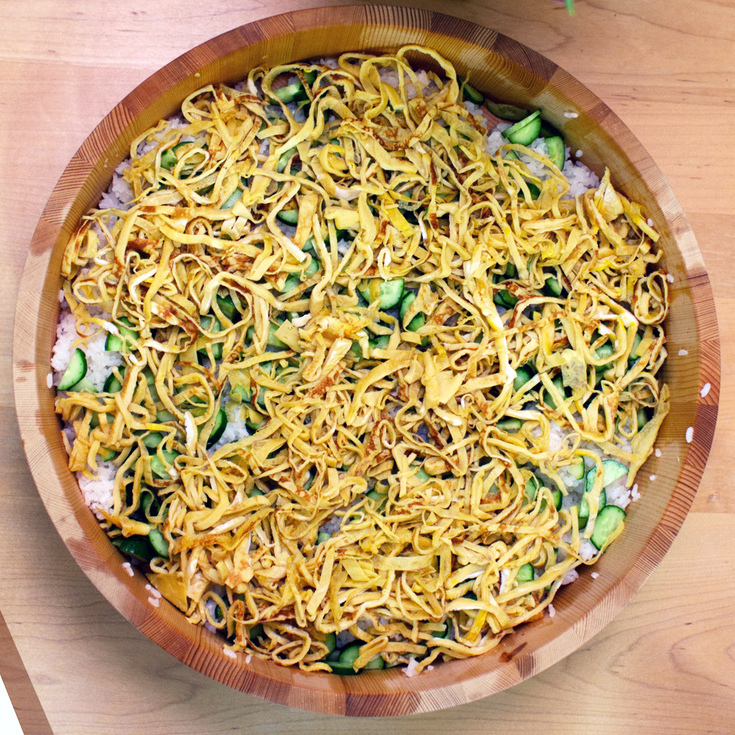 Here’s a recipe from Maki, one of my favourite bloggers. I bought her Just Bento cookbook as soon as it was available and highly recommend it. Rinse the sashimi in cold water and pat dry with a paper towel. Using a very sharp knife and clean cutting board, cut the fish into slices. Don’t worry if it doesn’t look perfect. This is a very forgiving dish in terms of presentation. Just before eating, start to assemble it. First, spread the rice lightly and evenly over the bottom of your container. Add a layer of cucumbers, then the egg threads, the sashimi, and then finally the sprouts and salmon roe. You can also serve this at birthdays and other celebrations as it looks festive and scales easily! What do you like to eat on New Year’s Day? Follow me on Twitter or like my Facebook page if you enjoyed this post! yum! this reminds me of a similar korean dish called ‘hwe dup bap’ that i suddenly have a hankering for! What a coincidence, I love maangchi’s blog too! I’ve never tried making hwe dup bap — must put it on my list. That looks delicious–if only I liked raw fish! I might try this with some hot-smoked salmon; I think my kids would love it. Smoked salmon is a great option, as is anything that you like to eat. I forgot to mention that avocado would be a nice addition! *blush* Thanks for your kind words, Paul, and the encouragement (which I feel very undeserving of)! Yea, no wonder why you got blank looks for the raw fish thing when you were in HK. I never ate any raw fish dish until I went to Japanese restaurants…in my mid 20’s.